The first snus in the morning is my favorite one... I love sitting and waiting for this snus that I know will make me feel so good. When I have my morning snus I feel really calm and warm and cozy sitting here with my big cardigan. It is always very cold at the office in the morning and this warms me up. It is even better than the first cig in the morning was. Never thought I'd say that but it is true! My friend Anna came over for dinner last night. 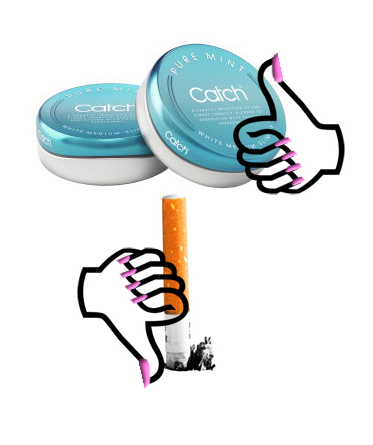 Had her try the Catch pure mint and she loved it! Hopefully she'll give up her smoking too!